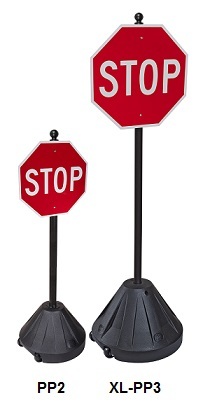 Light-weight Portable Sign Stand perfect for parking, temporary use or in-street signs. Two size bases - 18-inch that stands 48- or 58 inches, and 24-inch wide base that can be 4-, 5- or 6-foot tall. For sign sizes 12x18, 18x18, 18x24, 24x24 and 12x36-inch. Attractive pyramid-shaped stand comes with wheels, and 2-inch diameter posts are pre-drilled. Holds up to winds of 30 to 40 MPH. (Filled weight with water or sand about 50 lbs for smaller version and 70 lbs for the larger XL-PP3). Finial ball atop post permits easy transfer by tipping and moving along on pair of 3-inch recessed wheels. PP2 is 18 inches wide and 12-inches tall; XL-PP3 is 24-inch wide and 16 inches tall. Sign-mounting hardware included. Made in USA using recycled materials.